Elevation: minimum 597 feet, maximum 959 feet. Area Habitat: open land 14.00%, forest 84.89%, wetland 0.29%, open water 0.89%. Open under statewide regulations for all squirrel, turkey and furbearer seasons. Area closed for four consecutive days starting the first Friday in December to all hunting except archery deer hunting, muzzleloader deer hunting (when in season) and the quota pheasant hunt. Rabbit, quail and grouse hunters must check in and check out at a self-service kiosk and clearly display a department-provided hang-tag in a vehicle. hang tags available in advance through this website. Bear: Zone 3 (Bath and Fleming county portions). See the Black Bear Hunting page on this website for more details. Deer: On the main tract, the archery, crossbow, muzzleloader, and youth firearm seasons are open under statewide regulations, except archery hunting is closed during quota fox hunting field trials. The remainder of the WMA is open under statewide regulations for the archery, crossbow, muzzleloader and youth seasons, except during the quota deer hunt. Quota deer hunt, two consecutive days starting the first Saturday in November, limit four, only one of which may be antlered. Hunters awarded one preference point for each female deer harvested, up to four. Fox: Please check back for information. Grouse & Quail: Open until 3 p.m. (local time) on Tuesdays and Saturdays from Nov. 1 - Dec. 31, except when closed during the deer quota hunt and pheasant quota hunts. Daily bag limit is four quail and two grouse. Pheasant: Please check back for information. Rabbit: Nov. 1 - Dec. 31, except closed for the deer quota hunt and the pheasant quota hunt. Located approximately eight miles northeast of Carlisle, KY. From Carlisle take KY 32 north and turn right on KY 57, Cassidy Creek RD. There are two entrances, watch for area signs. Terrain is steep to rolling. Several boat ramps provide access to the Licking River. Horseback riding trails on main Nicholas County tract only. 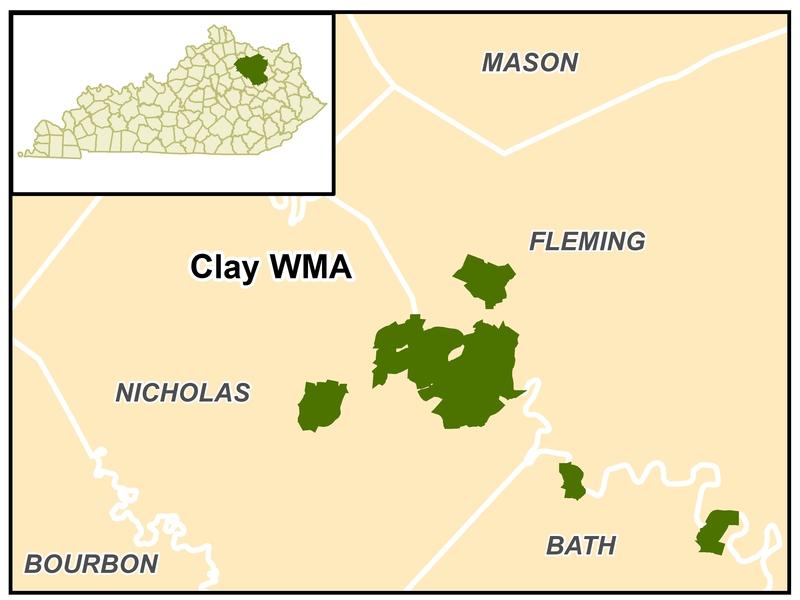 This WMA is closed to the public during quota fox hunting field trials. Owned by Kentucky Department of Fish and Wildlife Resources, portions purchased with funds from the Heritage Lands Conservation Fund.